What if you could get more bang for your buck, or your time? 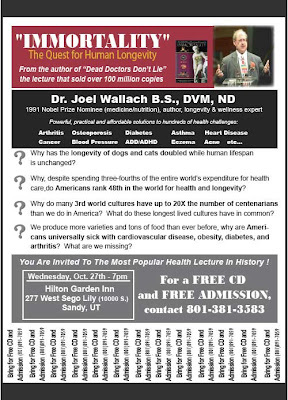 As many of you know, Dr Wallach is back in Sandpoint, ID; Creston, Canada; SLC; and Logan this week, & NC next month. by inviting people to come to the lecture. boards, mortgage agent, etc, you get the idea. If you don’t live in the area, maybe someone in your group, or a friend does, ask them to help. Send flyer as an email to your contact list, as an FYI, & ask them to pass it on. Text to phone contacts, post on Facebook, Twitter, etc. Plan to take a carload to the lecture, help them get seated, etc. and they will be signed up under you. You will benefit by receiving a thank-you note in the form of a check! Many have given us enough referrals that their thank-you note pays for all the products they use! Others have joined our team and with some training and a lot of dedication, now enjoy a full time income. We will be hosting a special Webinar Monday November 1st at 6:00 pm to 6:30 pm PST for a New Product Announcement! This is a Webinar You will want your entire team on! There is a link below to pre-register, be sure to forward the link to your entire Team! This New product is one I believe Everyone will want as soon as we announce its availability and You will want to be among the first to hear about it!